How's the general skill levels like in your contry? after that, the person has more knowledge of his skill and takes pride in compliments from those around him but he still sees errors in his ways. these are the levels in general. but there is one that is more excellent than the others. this person is aware tof the endlessness of enetering deeply into a certain way and never thinks lof ever being finished. he truly knows of his own insuffiencies and never in his whole life that he has succeeded. he has no thoughts of pride but with sel-abasement knows the way to the end. it is said that master yagyu once remarked "i do not know hos to defeat others, but the way to defeat myself." throughout your life advance daily, become more skillfull than yesterday, more skillful than today. this is never ending. so after you read that, how do you now ask "what is your skill level like?" my reply is "come and watch me"
note the way i have not revealed any of my ways of using Kazuya Mishima, although imay think i am good ,and i havent done any playing for awhile, i do not think of my self as being masterful of him. do you think that becasue u may know all of thier attacks off by heart that you are now a master?, what about your tactics, do tehy always work in such a way that you cannot be hit, in my real life experiences it is better to keep attacking in large combos, althoguht the game itself may not be realistic you can still try many tactics that may work, if one doesnt work try a different one. in my days of gaming i used to think that the perfect technique should always be combined witht eh perfect tactics and this being realised you should end up not taking a hit, but if bot contenders are of equal 'skill' level then it may be down to persaverance. Blocking and dodging can be a useful part to any match, it also opens up certain areas for weakspots and different attacks, for those characters with parrying these slow downthe opponent. 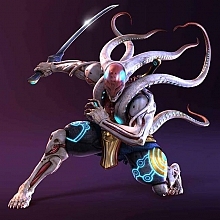 also kicks and punches can aslo slow down an opponent even when they are blocked, ie Tsnami kick and rising sun to spinnig kicks, these give a certain speed change and it alows you to comence a more powerful move taking off more health. Very philosophical approach, Kazuya. I also used to support myself with all these thoughts, very similar ones if not identical. The truth is that every time I want to specify my level, I fail. I just cannot judge myself. Thinking about myself drastically lower my performance. Now all what I see is training that I must perform every day. Or rather my lack of trainings that make me achieve the places on tourneys I deserve. The correlation between amount of trainings and the place in tourneys is clearly seen. Last time I had a lot of trainings, and I won third place. Another time I didn't train a lot, and I was 16th. The results speak for themselves. Your performance depends on your trainings (and so your skill, being comfortable with your controller and doing what you want), flexibility and well-thought tactics born from concentration and determination. Of course the more experience you have, the better for your imagination. That's pretty much all... no higher thoughts. I came to this conclusion seeing top Polish players, as Robson. He just plays, trains and makes countless analyzis. He has the mind of strategist. Adopted what's useful, recejted what's not... and just plays and wins. The only thing that counts is the amount of training before the tourney. If he's served with extensive free sparrings, he will surely win. Of course it doesn't mean I don't want to know the mind games you spoke about, Kazuya. ^^ I also have some of them up my sleeve, we can share them if you want. ok mainly The UK Tekken scence has many players and international players from all over the world take time to come down here and well play with us. we also have people like Adamski and Black Dragon who also makes the scene what it is, but recertly we have had more players come onto the scence and Tissuemon from Japan has joined us on Friday Nights to bust us up, but it also brings the UK level up because we are playing agaist someone from one of the most fread Tekken countries in the world.